For many years, disasters were regarded as divine acts and very little could reasonably be done to avoid the devastating impact of such complex, chaotic, or unpredictable events. Countries limited most of their efforts to rescuing victims after a disaster had struck. Happily, that fatalistic attitude has evolved into a more proactive approach thanks to the growing number of professionals who since the mid-1970s have amassed knowledge and developed tools to address the health consequences of disasters. Today, this body of knowledge is so broad that disaster management has become a specialized field of its own. 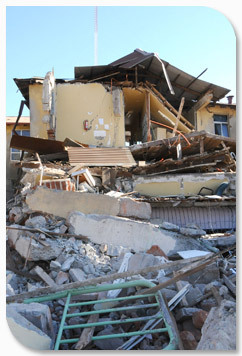 The term “disaster” is frequently associated with natural hazards. However, a disaster can occur as a result of any type of hazard (a hurricane, a fatal virus, a radiological event, etc.) unfolding in combination with consequences such as loss of life or destruction of property. Disaster risk is expressed as the probability that a threatening event will occur, combined with the vulnerability present in a specific area. In disaster situations, the principal concern of the public health community is to reduce the health hazards associated with these events. As a result, disaster management focuses on people and on the systems that can be affected by disasters. If disaster impact is quantified as a percentage, it is lower in the health sector than in other sectors. However, it is growing. The table below shows that health sector damage and losses from the Haiti earthquake represented only 6% of all damage and losses. [a] Damage and losses to the environment sector mostly include solid waste removal (debris, hospital waste, hazardous substances, etc.). Source: Adapted from figures presented in Table 2 of the PDNA (Haiti, 2010, 7). On this day, an earthquake measuring 7.5 degrees on the Richter scale shook Guatemala. In over a third of the country, adobe houses with heavy tile ceilings collapsed on their sleeping occupants in a matter of seconds. Some 23,000 people died or disappeared. In 1979, Hurricane David devastated the economy of Dominica, a small Caribbean island with 90,000 inhabitants. Although from a global perspective this could be considered a disaster of modest proportions in light of the relatively small number of victims, the fact is that the hurricane left 80% of the population homeless, and this disaster is considered by many to be a critical point for the Caribbean. In these two cases, the public and private sectors—both national and international—mobilized generously and spontaneously in order to help the victims. But limitations were immediately evident as a consequence of factors such as lack of preparation and training in key sectors, weaknesses in existing legislation, and inadequate mechanisms for national response, which had traditionally been based on the concept of a military chain of command rather than on dialogue and coordination. The health sector, which is one of first to respond in major disasters, realized that the way to improve its performance was by sectoral planning and training. The era of improvised response thus yielded to the era of preparation.